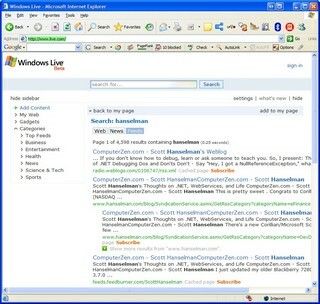 Windows Live - I just don't get it. Is it just me? Perhaps I'm just old (in web years) or did the web just get WAY more complicated than it needs to be? There's msn.com, there's MSN Messenger, there's Windows Messenger, there's Office Communicator, there's Hotmail, yada yada yada. Tell me that this: http://ideas.live.com/ isn't going to confuse folks even more? Why does Microsoft feel the need to release Yet Another Web Portal? Live Safety Center = McAfee, et. al. P.S. The fact that http://www.live.com looks considerably different in my build of Firefox is really unfortunate given that everyone else seems to manage cross-browser at this point in the game. P.P.S. 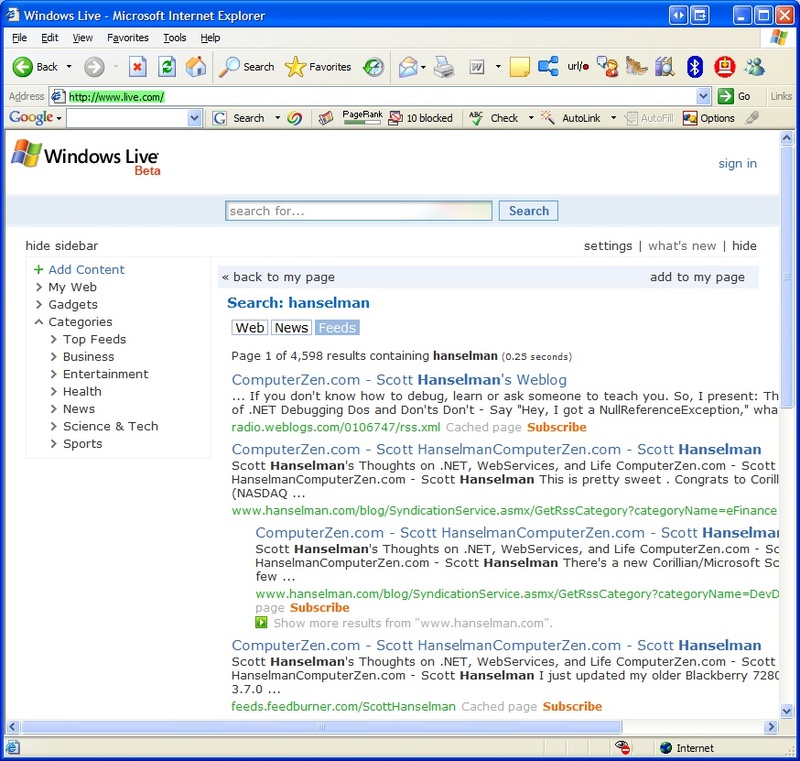 Note the search on Live.com for "Hanselman" yields a #1 result for my old blog from 3 years ago. A blog I haven't updated in I don't know how long. Results #2 and #3 are for, some reason, sub-categories of my current blog. P.P.P.S. Patrick says, "Ah, like My Yahoo. Welcome to 1996." P.P.P.P.S. I typed in "PDX," the airport code for Portland Airport into the Weather Gadget and got Vancouver, WA. Stunning.